Sounds like something Jonathan Swift or Mark Twain would write, though I highly doubt there’s any satire intended here. Well, if you’ll excuse me, I’m off to give my ant slaves their chores for the day. He’s a changed ant these days, back then he was hanging about with a crowd of dodgy woodlice. I do have miniature CCTV trained on him just to be sure mind you. I thought this article was some kind of hoax, or an attempt to justify slavery, but apparently it’s true. 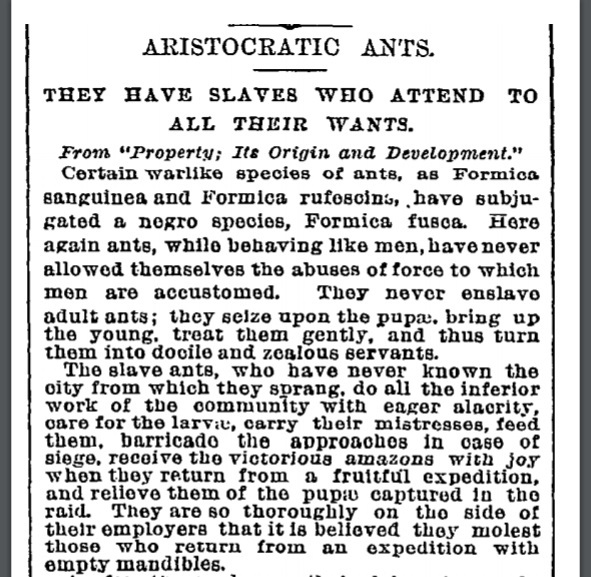 The thing I found most interesting, however, was that the slave-making ants were described as having ‘specialised’ so much that they could no longer look after their own young or even feed themselves. Now /that/ is a counter survival behaviour if ever there was one. If catastrophe struck and they ran out of smaller ants to enslave, the whole species would die out. I guess this is an example of a lop-sided symbiosis in which the more powerful partner is, in evolutionary terms, the weaker. …us. 😀 Yes, it is interesting isn’t it? Dead Ant . . . Dead Ant . . . Dead Ant, Dead Ant, Dead Ant, Dead Ant, Dead Aaaannt . . .
No, I’d never heard about it. What an amazing story. The paradoxes in the article itself are amazing, the writer can’t help but highlight the importance of the aristocracy/wealth/importance of the Hungarian family- as a marker of value. This entry was posted on July 3, 2017 by The Pink Agendist in thinking aloud and tagged animals, ants, biology, nature, sociology.